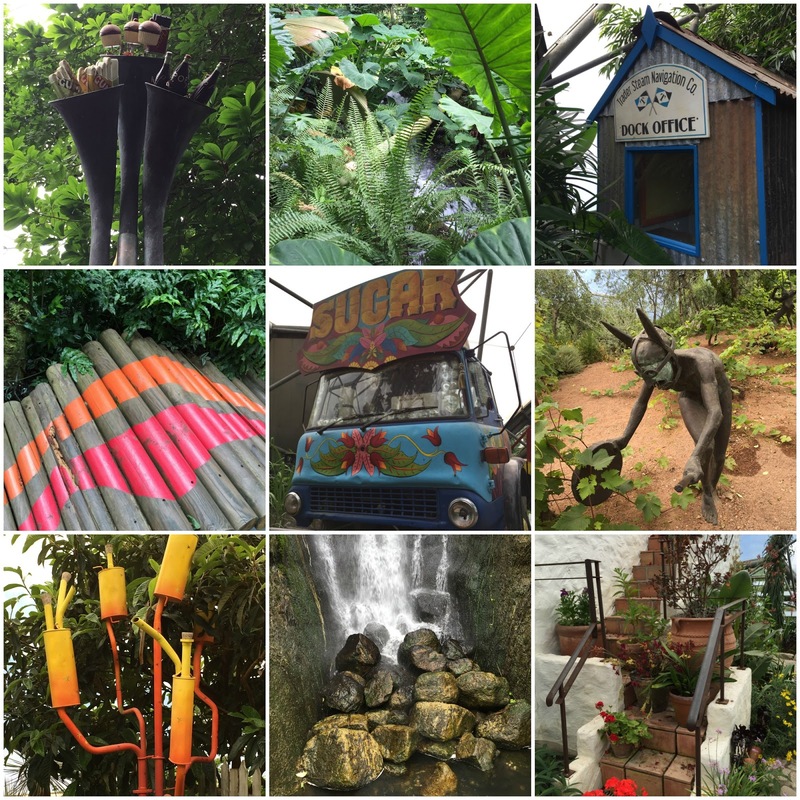 On our recent weekend break in Cornwall we decided to visit The Eden Project. Ram and I visited years ago, soon after it opened in fact, and I've been wanting to take the children along for a long time, but it's just so far away from us! Staying in Newquay we were about a 30 minute drive away. We booked our tickets in advance, which saves 10% on the ticket prices, and tickets are valid for 28 days after purchase so you don't need to select a specific date. See the link at the bottom of this post for full ticket details. We visited on a Sunday in early June, and deliberately chose a day that was forecast to be showery in the hope of avoiding crowds. We arrived just as it opened, and as we had hoped it was a very quiet day. A great deal of the attraction is indoors, so we managed to time our visit to avoid most of the showers and started off in the Rainforest Biome. The Rainforest Biome is the largest of the two biomes, and simulates a rainforest environment filled with tropical plants and lots of educational exhibits to teach about the importance of rainforests and how we use the resources that it provides. It's very warm and humid inside, but not overwhelmingly so. You can take the Rainforest Canopy Walkway to see the biome from above, along with some other exhibits, and there is plenty to explore. There are hands on exhibits for children, such as this section about tapping rubber trees which was very interesting. Then we walked through to the Mediterranean Biome, which is cooler and a lot more open, housing warm temperate and arid plants and sculptures. There is lots to learn about farming and how crops are grown, and Harry was fascinated by a beautiful mosaic walkway that contained a dove mosaic for each country that was known for olive production. Because we were not visiting from home we weren't able to take a packed lunch as we normally do, so we were reliant on food that we could purchase there, and with two fussy children I was a little concerned about what we would find them to eat. Fortunately we hit upon a winner with the children's lunch selection. For £5.95 you could select any five items, and so we chose five items that the children could share among themselves, to eat along with some snacks and drinks that we had brought along. You can see the great selection below, and you could also choose from packs of plain crisps or individual pieces of fruit, I was very impressed. For Ram and I we bought burritos and nachos with vegetables, which were filling and reasonably priced. Then with the showers having ceased, we headed off to explore the outside areas. The Outdoor Gardens represent the temperate regions of the world in the plants that are grown, as well as many local species. There is lots to see, and various little corners tucked away that children can explore and find exciting things to see. This little house is hollowed out of a large tree trunk. This climbing frame was a bit of a challenge but they got there in the end! We also had fun exploring The Core during a well timed rain shower, where we learned about the importance of the relationship between people and plants, and also enjoyed some fascinating exhibits about water and how despite the planet being over 70% water, only a very tiny percentage of that is freshwater that we can access. I'll admit that we don't normally indulge the children with purchases from the gift shop when we are on a day out, but this time we caved and bought the Children's Guide Book for £5, as Harry had shown such a huge interest in visiting the Eden Project beforehand. I'm really glad we did, he loved following it through during our visit and he's been reading it avidly ever since, it's definitely a book that he's going to pick up over again, not just for when you are there. We had a great day at The Eden Project, would definitely recommend a visit! Two adult and two child tickets to The Eden Project cost us £70.20, and you can check current ticket prices here. If you choose to donate your entry fee when purchasing then your tickets will be converted into an Annual Pass, so you can visit as many times as you like during the year after your visit. At the weekend I returned to The Brewery in London to attend my fourth BritMums Live blogging conference, this year rebranded to BML16. The format also changed this year, with the conference taking place over just the one day instead of two. It did feel a little compressed, but having said that there were still plenty of breaks and time for chatting. The first session that I attended was 10 Ways to Tell Compelling stories with Photography by Charly Dove. Charly takes such beautiful photos and it was very interesting to hear her share her tips, it has really inspired me to concentrate a little more on the photos that I use on my blog. I'm never any good at taking notes on the sessions, but I did manage to capture the key points, and the ten things to consider are - capture what excites you, find a hook, show context, capture emotion, adopt a theme, isolate your subjects, frame your stories, focus on the details, chase the light and look for unusual perspectives - all great things to remember when taking and selecting photographs. The second session that I attended was YouTube: Collaborate and Grow your Audience. It was a slick presentation and I found it really interesting to learn about some of the bigger YouTubers. However although I enjoy making videos and sharing them (you can find my YouTube channel here) I don't see myself as a vlogger and I'll never be in the same league as the big YouTube personalities, so it was a little beyond my skill level. I did pick up some tips though about the importance of customising your YouTube channel, for example making your own thumbnail pictures and choosing which content to showcase. It was also helpful to be reminded about how you can make your channel more appealing to certain audiences if you have been featured for a particular type of video, for example if I were to find myself in a position to attract subscribers with an interest in travel I'd want to make sure that the look and feel of my channel reflected that niche. After lunch I spent some time walking around the Hub to meet with the brands and sponsors. I was a little more discerning this year and focused on the ones that really appealed to me. I spent a bit of time chatting with the lovely ladies from Fellowes who were kind enough to pass on some of their goodies to me at the end of the day and I enjoyed the Big Little Tent Festival lounge. We also had fun attempting to play tennis on the mini indoor pitch. I'm absolutely terrible for taking photographs as I get so caught up in the moment, but I managed a few snaps of the gorgeous outdoor area! Finally I went to learn about Instagram. I've really been concentrating on my Instagram feed lately (you can find me here) and trying to think carefully about the pictures that I post. It was great to pick up a few tips, like using backgrounds and props, not posting too many pictures one after the other, and using hashtags. I'm inspired to start joining in with some Instagram challenges to meet other like minded people, so it was good to be reminded about the #sgiew hashtag hosted by sogoodineveryway, I'll be keeping an eye out and taking part! There were plenty of breaks during the day for catching up with people which was good, as the conference is definitely about the social side for me. It didn't feel as busy as it has in recent years, there was lots of space, somewhere to sit while eating lunch, and it wasn't so intimidating as it was easy to spot someone that I recognised if was feeling lost. For me, the main reason to attend BritMums is for the social side, and it gets easier every year as I get to know more bloggers. The sessions were good, but I always seem to take more from chatting to others and picking up tips and inspiration that way. I was a little worried that I wouldn't know as many people this year as there are so many new bloggers, but I needn't have worried. I had a lovely time chatting to so many people that I'm afraid I can't mention them all, but it was really great to catch up with Swazi and Louise, my conference companions since my very first back in 2013, and to have a proper long chat with Sarah. I was also grateful to Jaime and Clare for taking me along to All Bar One on the Friday night where I had a great evening, and it was good to see Aly who has been such a help lately as I start to get to grips with SnapChat. With huge thanks to Make it Coats for sponsoring me to attend. Summer is on the way, and Baker Ross have some lovely items in their summer crafting range. We were sent a few bits and pieces to try out, and like usual we've been having lots of fun. We started with some Seaside Sand Art Pictures. This craft has the potential to get quite messy, but the older the child the more you are able to keep it under control. The pictures are printed onto sticky paper, and you can remove individual sections of the design one at a time. So you remove one area, sprinkle on the sand, press it about a bit and then tap off the excess sand to reveal a nice, sharply defined, sandy area. As long as you've covered an area thoroughly, sand of a different colour won't stick to it when you move on to the next area. And once stuck, the sand doesn't come off, so it doesn't create more mess once you've finished. We used Glitter sand 30g bags which come in lovely bright, vibrant colours with plenty of glitter. The sand does come in little bags which can be a bit fiddly, Baker Ross also sell coloured sand in shaker pots which we tried last year, and these were easier and less messy to use. There was plenty of sand in the packs and definitely enough to complete all the pictures, even with a bit of wastage. We all completed a picture, and Harry absolutely loved it and went on to do a couple more by himself, he was surprisingly tidy and I think that the finished work looks amazing. Next, with the summer holidays coming up, the children wanted to make some keepsake gifts for their friends. First they made some Dinosaur Wooden Photo Frames. The wooden frames were decorated with felt tip pens and then they chose pictures to go inside that I printed out for them. Harry wanted a picture of him with one of his friends and Mia typically chose princesses! Then Mia made some Sealife Spiral Notebook Kits which will make lovely gifts for some more of her friends. There are four different sea creatures in the set and you just need to stick the foam pieces in the right place to decorate them, or you can adapt the designs to make them more individual. They are really sweet! Finally they each made some bracelets for their friends. The Unicorn Charm Bracelet Kits make up into really pretty bracelets and were easy for Mia to make. They are so simple because you just need to thread the beads onto some elastic and then it stretches to fit their wrist, so you don't need to worry too much about the sizing. The Paracord Bracelet Kits were a little more complicated to work out and I'm not sure that I've got it entirely correct. 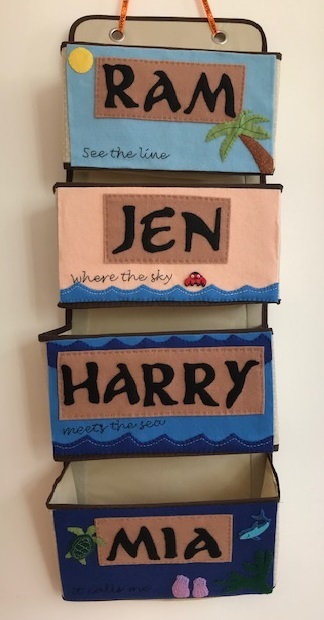 They look nice and are a lovely gift idea but I'm going to be putting the kits aside until the children are a bit older! Another lovely selection of summer crafts! On our recent break to Cornwall we were invited along to Pirate's Quest, an indoor and immersive walk through experience hosted by real life pirates which takes you on a journey to learn all about Cornwall's pirating history. When we arrived, the children were thrilled to be given a pirate map which gave them an overview of the things that we were going to see, and had some puzzles on the back for them to complete. The puzzles ranged in difficulty making them suitable for all ages, and they chose to look for letter clues along their tour to spell out a pirate word. We had fun taking some pirate pictures outside while we waited for our tour to start. If I'd thought about it I would have dressed them up in pirate costumes with accessories! (And I promise the grumpy faces are just for the photo!) The gift shop is very well stocked with pirate related items. After an introductory video we met the pirate that would be our guide, and he was excellent. Our group was quite small, just our family and another with a slightly younger boy, and he pitched his tour to our group perfectly. Harry in particular was a little apprehensive about the attraction, and it was nice that the pirate reassured us very early on that he was a friendly pirate and not scary. As we made our way through the different areas we didn't just learn about pirates, there was also a room filled with models depicting some of the myths of Cornwall, like the legends of King Arthur and Bolster the giant. We learned some fascinating pirate facts, like the real reason that pirates wore eye patches and why they are known for drinking rum. There were lots of chances for the children to get involved. Mia had a brilliant time spinning the wheel on the pirate ship and would have sent us round and round in circles, Harry was more deliberate in his wheel control and a much more considerate sailor. The other little boy on the tour was put into the stocks, and they all had the chance to try and pull the sword from the stone. Towards the end of the tour there is an optional scare section. Harry had studied a leaflet for the attraction beforehand and knew that this was coming up, so he refused to go in and wanted me to stay outside with him. We waited for the others in a nice, quiet corridor while Ram took Mia through. She was absolutely fine and Ram said it wasn't too scary, I suspect because of the young ages of the children the scariness wasn't ramped up as much as it might be for other groups! We visited on a weekday in early June so it wasn't a busy day for the attraction and we only had one pirate running our tour. We were told that during busier times the tours run more frequently, and so you'll get to meet more pirates as you make your way around. It didn't affect our experience as our pirate was excellent, but it's worth knowing that your experience might differ depending on when you visit. The tour took just under an hour, and at the end we returned to the gift shop where the children could show their completed treasure maps and receive a little prize. They really enjoyed Pirate's Quest, and it's a great one for a day when the weather isn't good enough for the beach. Our visit to Pirate's Quest was complimentary in exchange for this review. It's recommended to book tickets in advance as the tours can get busy. The price for two adults and two children is currently £34, you can see all prices and ticket options on the Pirates Quest tickets website. 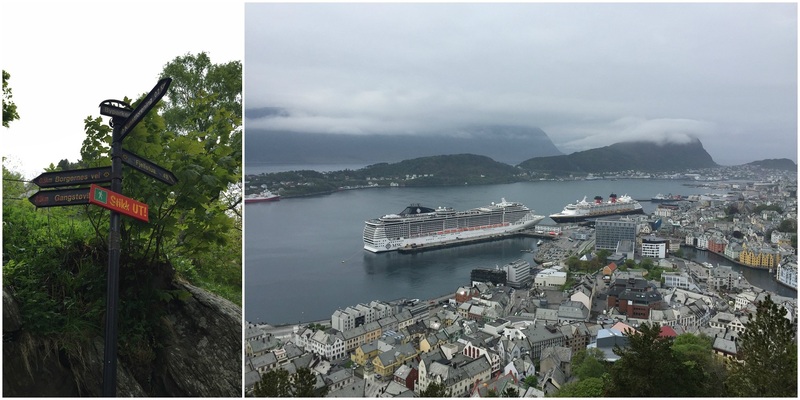 On our recent cruise to Norway aboard the Disney Magic we made four stops in Norway, and I thought I'd share a little bit about what we got up to in each port. As our children are quite little we generally spent the morning in port before returning to the ship for lunch and afternoon activities. One of the things that was brilliant about this itinerary was that the ship docked right in the centre of town at each stop so it was an easy walk to see the main sights. We saw the sights independently and didn't take any official Disney Port Adventure excursions. 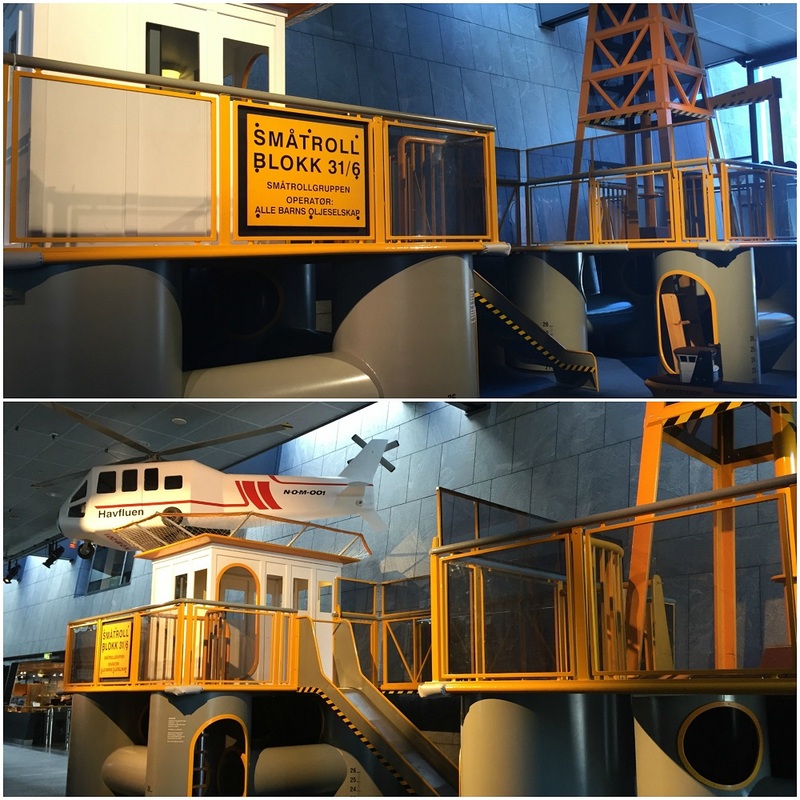 Our first stop was Stavanger, and we began the day at the The Norwegian Petroleum Museum (Norsk Oljemuseum). It's a great museum with plenty to see and lots of really interesting information about the petroleum industry and its importance to Norway, so it was a great first introduction to Norway for us as well. Directly outside the museum we discovered the Stavanger Geopark which was brilliant. The children had a great time exploring the play area made from recycled bits and pieces from the oil industry, all decorated with brightly coloured graffiti. Then we went for a short walk around the town back to the ship, taking in the lovely park and cathedral, it's a really lovely town for strolling around. In Alesund we visited The Sunnmøre Museum, an open air museum located a short bus ride from the dock. The museum contains more than 55 well preserved buildings which trace the history of the area from the Middle Ages to the early 20th century. On the way back we got off the bus a couple of stops before the dock and headed for the Town Park, where we climbed the 418 step staircase up to Mount Aksla. It was a busy climb but the children managed it fine and although a little cloudy we had some fantastic views from the top, all across the town and back to the ship. Geiranger is a tiny town, a village really, deep in the fjords, and there are some fantastic excursions that you can book here both through the cruise line and privately. We opted for a tour on the red Hop On Hop Off bus which took us to the Flydalsjuvet Viewpoint and also made a couple of other stops. With hindsight we should perhaps have investigated a private taxi, as it was quite an expensive trip. It was worth doing though, we had around ten minutes to spend at the viewpoint which was spectacular and the journey up along hairpin bends was breathtaking also. On our way down we got off the bus at the Norwegian Fjord Centre and the top of the Waterfall Walk. The Waterfall Walk is a safe walk with steps and walkways alongside the waterfall which runs through the town. Going down was much easier for little legs, but going up it's perhaps easier to appreciate the views. There is quite a lot of spray from the water so it's a good idea to have a jacket, and the spray makes lovely rainbows if it's sunny. The walk starts right in the middle of town and it's easy to find. Back at the bottom we went for a short walk around the bay, it was a nice flat stroll with a stream for the children to throw leaves in and some lovely views of the ship nestled in the fjord. Bergen was the largest town that we visited, but everything we wanted to see was well within walking distance. 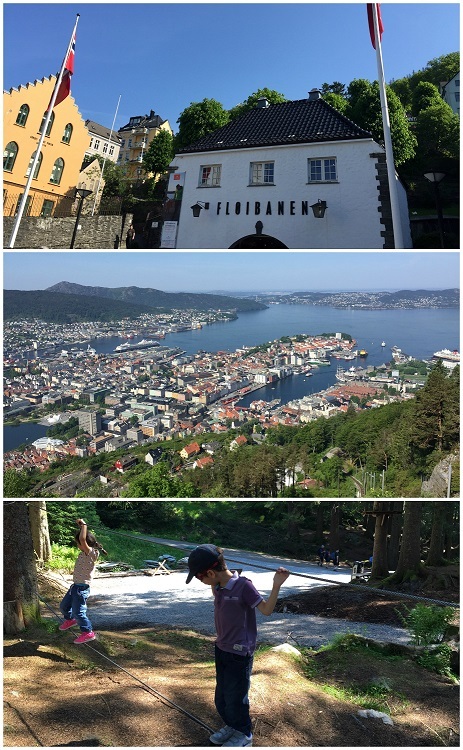 We started our day by taking the funicular (Floibanen) to the top of Mount Floyen. There was quite a queue when we arrived so we saved some time by booking tickets on our phone (using the free wi-fi there) and so were able to get straight on to a train. When we left there was an even longer queue, so if you know that you'll be visiting it's definitely worth booking tickets in advance and arriving early in the day. At the top of Mount Floyen we had some spectacular scenic views over the town, and then the children were delighted to find not one but several different playgrounds spread across the mountain top. It would probably be a lovely walk up and/or down the hill if you were up to it, and it was really beautiful. All around the playground there were carved trolls dotted about and we had a lot of fun hunting for them, there was even a little house with a couple of trolls inside. Then we walked back through the town, we had a quick look around the market and admired the Bryggen area with its picturesque historic houses, and spent our last few bits of Norwegian money in the gift shops. We really enjoyed all the ports on this itinerary! If you are interested in a cruise on the Disney Magic you can find my Stateroom review and video here, or else enjoy a video of the Adventures Away Celebration Party below! 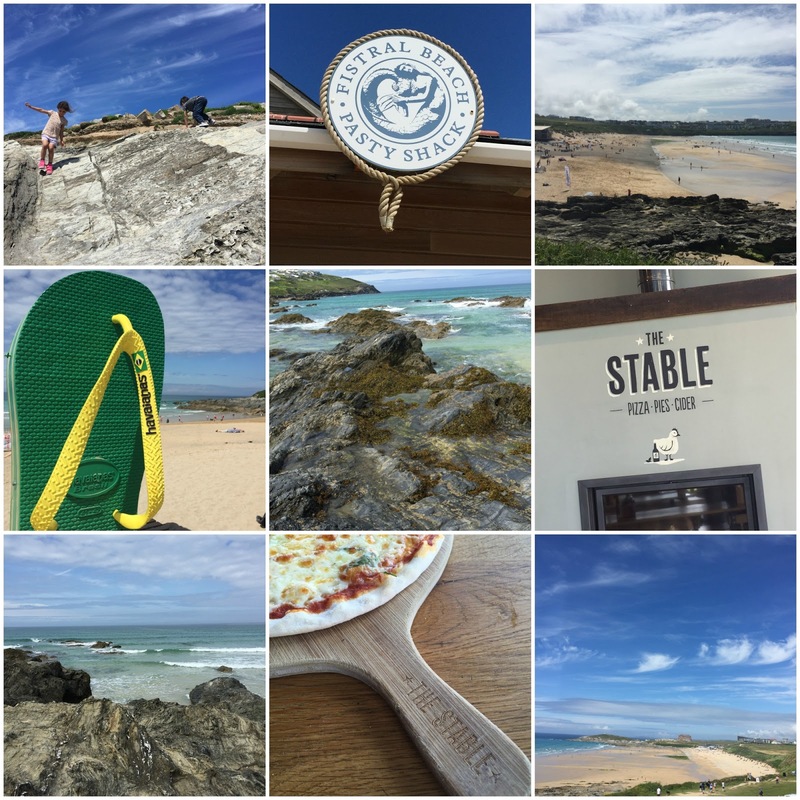 At the weekend, we were invited to stay for a couple of days at The Esplanade Hotel located on Fistral Beach, Newquay, to spend time together as a family enjoying the family friendly facilities and beautiful sandy beach. Our family room was located at the front of the hotel, with a large bay window and fantastic view across Fistral Beach. The children slept in bunk beds which they loved (fortunately staying for two nights meant that they could have a turn each!) and they were delighted to find a towel animal and goody bag waiting for them on their beds. Our bed was large and comfortable, the room was spacious, and everything was spotless. There was plenty of storage space, and I loved the table and chairs in front of the window where you could sit and gaze out. I also appreciate a well stocked tea and coffee making selection, especially when it includes hot chocolate and biscuits, and of course complimentary wi-fi is always a plus! It was also a lovely touch to have a phone call shortly after we had arrived in our room - there's often something that you forgot to ask at check in. Below was the view from our large bay window - amazing! I loved watching the tide going in and out through the day, seeing the surfers and the people strolling on the beach, and falling asleep to the sound of the waves. We also had a great view of a firework display which I believe was linked to the Night Surf competition taking place on the beach while we were there. The hotel is located on Fistral Beach, and it takes minutes to cross the road and descend the steps to the sand. The hotel's slogan is "The beach is our playground" and it describes it perfectly - the beach really did feel like an extension of the hotel. As well as spending time there during the day it was close enough to pop down in the evenings for a walk and some rock climbing. I've always found the scenery in Cornwall to be stunning and I love the contrast between the yellow sand and rugged rocks, perfect for sandcastles as well as climbing and rockpooling. 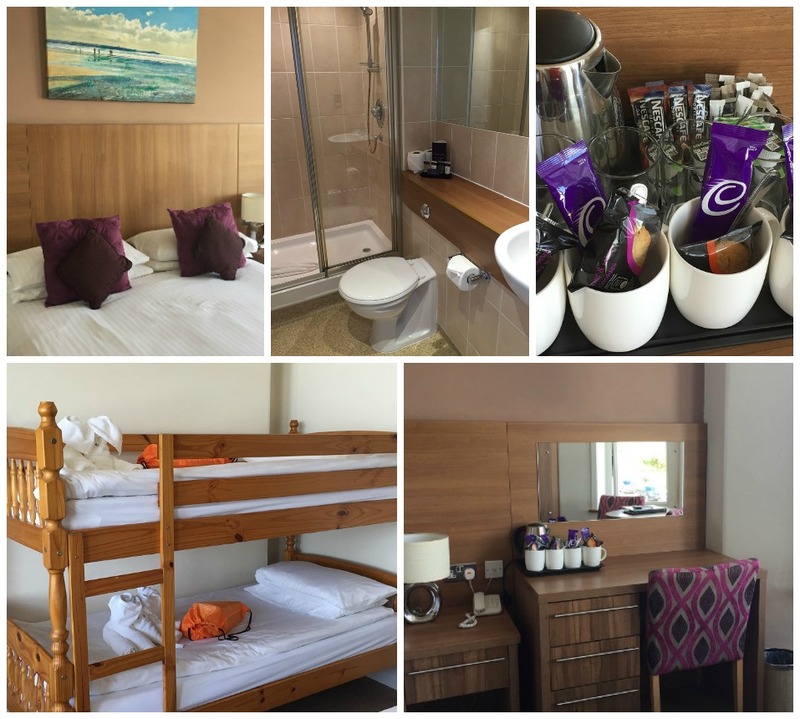 Fistral Beach is well known for surfing, and the hotel houses the Quiksilver Surf School with coaching and facilities. Our children aren't confident enough in the water to try surfing yet, but the hotel offers surf adventure breaks with accommodation and surfing lessons. We ate dinner at the hotel one evening and enjoyed two breakfasts. There was a great selection to choose from at dinner, and the children's menu in particular was very good. Our children are fussy eaters and there was a nice selection including some simpler food that appealed to them like vegetable sticks, and they loved having their ice cream dessert served in a bucket! The breakfast selection was also very good for us all, with hot and cold buffet items and plenty of choice. 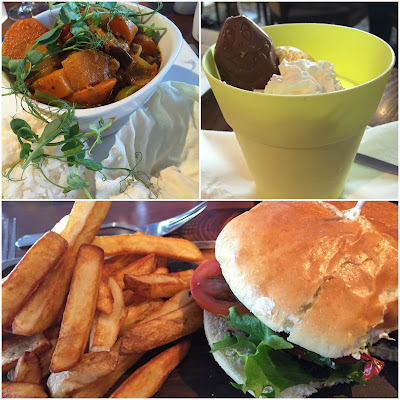 There are also plenty of dining options locally, we enjoyed a lovely pizza lunch at The Stable which is a short walk from the hotel at the other side of the beach with fantastic views, and we ate dinner at The Fort Inn in town which has a great indoor play area for the children. There are plenty of facilities in the hotel for families. The lovely indoor swimming pool is absolutely immaculate, with changing cubicles, showers and lockers. The pool has a very shallow splash pool at one end and a larger deeper pool for swimming. It was out of depth for our children so you'd want to bring armbands and so on for non swimmers. There is also a hot tub and sauna and extra towels are provided in the pool area. The hotel also has an indoor soft play area with toys, a pool table, and an outdoor play area with a themed pirate ship to play on. We brought buckets and spades for the beach with us, but I was impressed to find a large chest filled with beach accessories that you could borrow, as well as board games for when it's more of an indoor day. There is a free car park at the hotel, and then additional free parking on the road opposite. You can reserve a parking space in the hotel car park for £10 a day which will be marked with your family name. If you are visiting at a peak time I'd definitely recommend considering this, as I can see that the car park would get busy, especially as it is also used by the surf school. There is plenty to do in the local area. 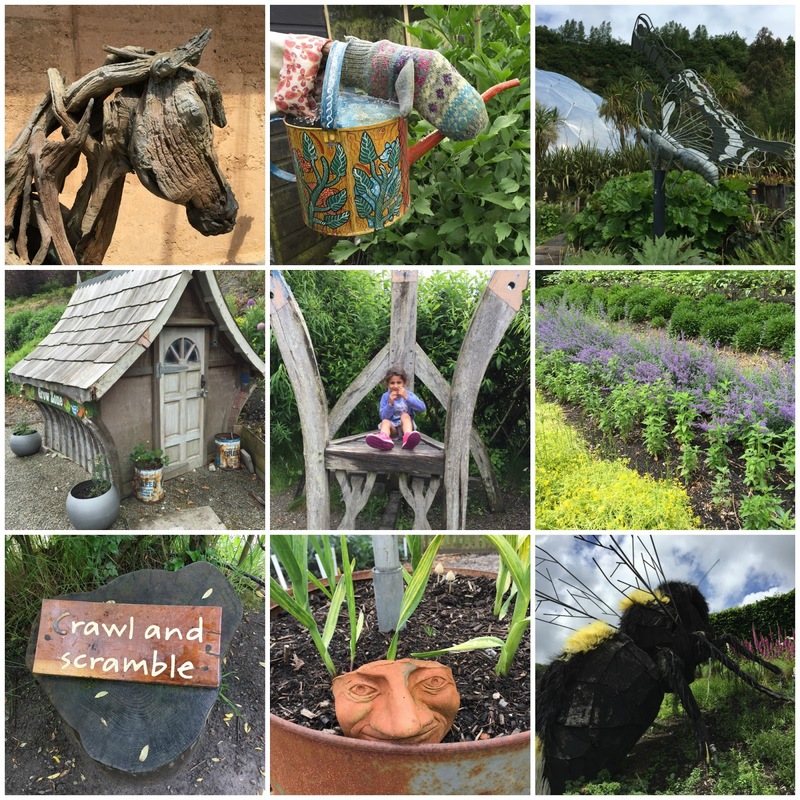 We spent a fantastic day at the Eden Project which is about a half hour drive away, and we also visited Pirate's Quest in Newquay - full reviews to follow shortly! We had a fantastic stay at the Esplanade Hotel and a really lovely weekend away in Cornwall, and I really can't think of anything negative to say. The hotel's location so close to the beach is absolutely perfect, and we made some lovely family memories together on the beach. It's also a great location for exploring beautiful Cornwall, and the high standard of the hotel made for a wonderful weekend break. Our two night stay at the Esplanade Hotel, along with dinner and breakfast, was complimentary in exchange for a review on my blog. On our recent Norwegian cruise we spent a day in Stavanger, Norway, and a highlight of our day was a visit to The Norwegian Petroleum Museum (Norsk Oljemuseum). Located in the centre of town and just a short, pleasant walk from where the ship docked, this modern museum explores how oil and gas were created millions of years ago, how petroleum is found and used, and its importance to the country of Norway. The museum was very well designed for children. We watched a short introductory film which was very informative, and was hosted by cartoon character Petro the cat who also featured throughout the museum in the areas of particular interest to little ones. The children were also given a scavenger hunt with photographs of exhibits to spot during their visit. Some of them were quite tricky and so we all enjoyed taking part! When completed they were allowed to choose a small prize. In the main hall there are lots of models of oil rigs and other machinery relating to the oil industry. There is also a life boat that you can climb inside as well as lots of other equipment to see and we spent a long time looking at all the detailed models. Harry and I were both fascinated by this model of the Troll A platform, one of the greatest Norwegian engineering achievements of all time. This model is built to a 1:100 scale and the real structure measures 472 metres from the base of its skirts to the top of the flare boom. It's the tallest and heaviest human structure that has ever been moved into a different postition, and was towed into the North Sea in 1996. It was amazing to get a sense of just how tiny the platform on top is, compared to how much of the huge structure is hidden below the surface of the sea. Like all good museums there were plenty of interactive exhibits and buttons to press, and because all the equipment is real it's much more exciting. Below is a control room where the children could press a button to start the drill, as well as examine all the other different levers, buttons and dials close up. As well as the introductory video we also watched a short film showing deep sea divers working on an underwater pipe. It was really interesting to learn about the logistics of working at that depth under the water. Both films were shown hourly in English and all the museum signage was translated into English. At the end the children had a great time in the play area, a little oil platform with a helicopter to climb into and lots of tunnels and ladders to explore. 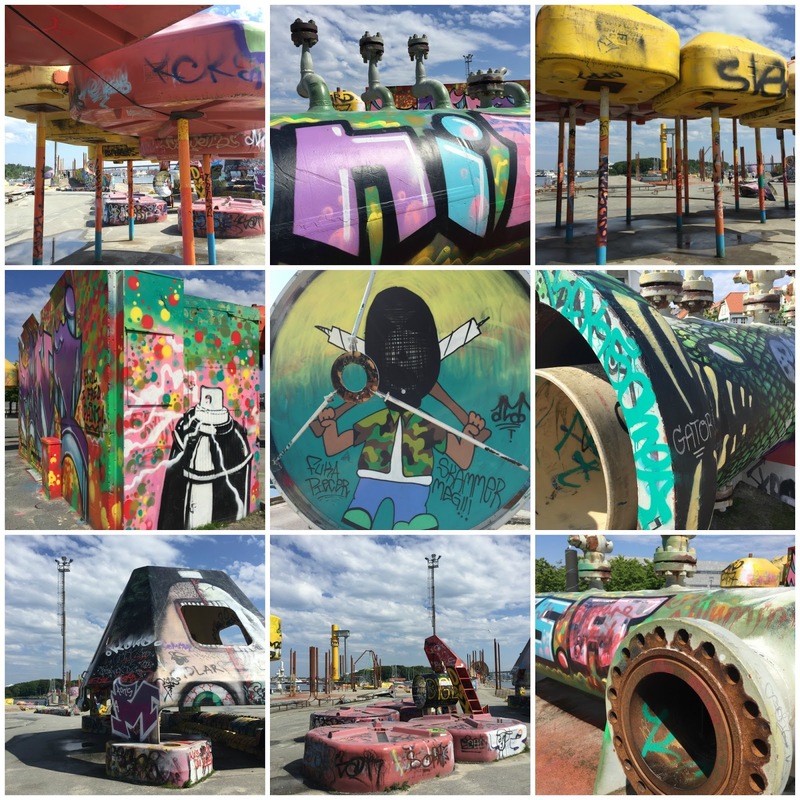 After our visit, just outside the museum we found the Stavanger Geopark, an amazing play area made from recycled parts from the petroleum industry and decorated with brightly coloured graffiti. The children had a great time playing here, and I spent ages taking photos of all the installations! We all learned a lot at the museum, and with the oil industry being so important to Norway it was a great introduction to the country. On our cruise on the way back to Dover we passed some oil rigs out at sea, and it was really interesting to see them being armed with a little more knowledge and understanding. I'd definitely recommend a visit! You can read more about our day in Stavanger and what we got up to in the other ports on our cruise here. This month my craft box from Bostik had a Jungle theme. I really loved the patterned jungle paper that we received, so I decided to try a collage activity, and as we always seem to be hunting for a bookmark I thought I'd add some jungle themed bookmarks to our collection. I found it easier to prepare all the materials in advance, before letting the children loose! First decide on the size and shape for your bookmark and cut it out of thin card. Ours measure about 6cm x 20cm so there is plenty of room for collage. Cut the animal print paper up into squares, or what every shape you choose. I went for small squares as I thought that the children might like to attempt mosaic designs but I included some larger ones too in case it became too fiddly. Use the White Glu to stick the collage paper pieces to the strips of cardboard. The glue doesn't dry straight away so you can cover large areas with glue at once for quicker sticking. You need to be careful not to use too much and make the cardboard too wet, but because the Bostik glue is nice and thick it didn't warp the cardboard at all. Leave the collage bookmarks out to dry thoroughly then trim the edges neatly. When they are dry, if you like you can cover them with clear contact paper to make them more durable and smooth down the paper edges. Alternatively, you could give them a top coating with a layer of glue to make sure that all the edges are stuck down firmly. Then find a template for a jungle looking leaf, I used this jungle leaf template for inspiration (but it's basically just a leaf shape with large notches cut out), and cut some leaves from the green craft foam. Then arrange the leaves on the bookmarks and secure in place with Bostik Glu Dots. I only needed a couple of dots for each leaf, and they stick nice and securely. Then use a hole punch to make a hole in the top of each bookmark and thread through some matching ribbon. It works better to tie the ribbon through firmly so that it doesn't slip out. And there you have it, a lovely collection of jungle themed bookmarks! You may also want to decorate the bookmarks with animal stickers or other embellishments, or perhaps letter stickers to form the child's name. This box of craft materials was provided to me free of charge by Bostik as part of the Tots100/Bostik Craft Bloggers Club.